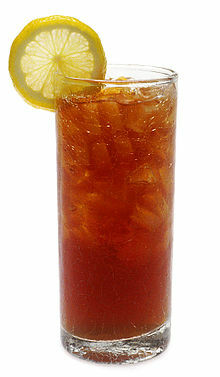 Iced Tea is a sweetened beverage made from tea and organic acids, and sometimes with flavouring adjuncts. It is popular in hot climates, usually served over ice. Fruit juices such as red or white cranberry, grape, orange, grapefruit and passionfruit can be added in amounts ranging from 10% to 25%. The easiest way to make this is with a drip coffee maker. Fill the machine with cold water and place the tea bags in the basket. Place the Stevia, acid and sugar in the pot and place the pot in the machine. Let it run through its cycle. Chill the product. This is a nectar and will make several litres of iced tea. Place some ice in a tall glass and fill 80%-90% with cold water. Pour in some iced tea nectar. You may reduce the water and add some fruit juice if desired. Note that this product contains virtually no sugar. While 4 teaspoons are used in the nectar, this is diluted so much that the amount of sugar in a glass is probably less than 1/4 teaspoon. On a hot day, it is particularly refreshing. While Stevia is fairly expensive, it goes a long way. Use only pure Stevia. Lemon or lime juice can be used instead of the acid crystals. This will make a cloudier finished product. Use about 4 ounces. Garnish with cherries, pineapple, lemon, or lime slices. This page was last edited on 17 January 2013, at 23:44.